More than 1 billion people live in slums without adequate housing. A San Francisco-based nonprofit has set out to tackle global homelessness in a new way: by 3-D printing homes. 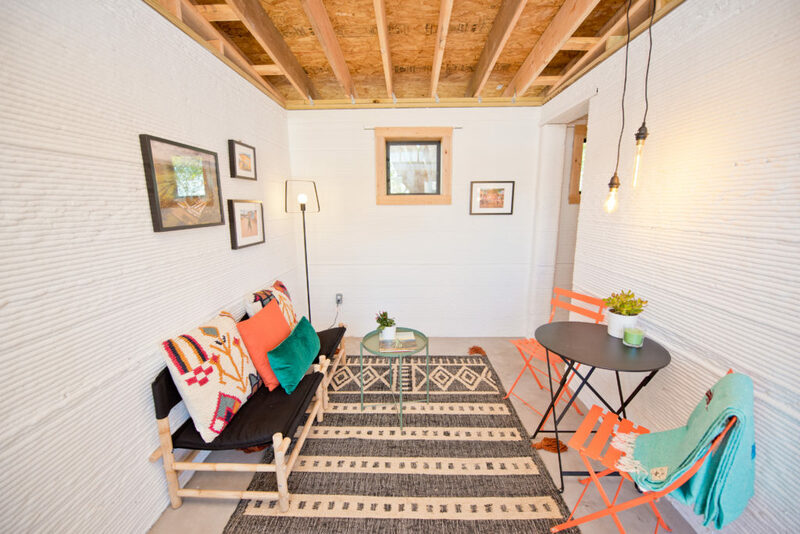 The first of these homes was on display at South by Southwest this month in a backyard in Austin. The 400-square-foot model house has a rounded porch, wood-paneled ceilings and large, vertical windows along its front side. 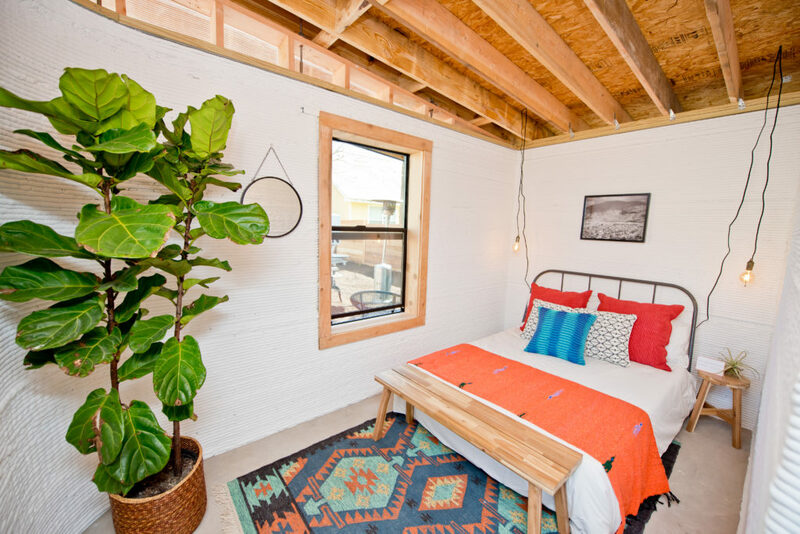 It was cozy, with a customized bedroom, bathroom and living space. The companies behind the home are New Story and the construction tech startup ICON. Their goals are ambitious, and their focus–for now–is on building houses in the Caribbean and Central and South America. New Story has already constructed more than 850 homes, not using 3-D printers, in Haiti, El Salvador and Bolivia. But each home was taking too much time to build, given the scope of the problem. Cue ICON. Nearly a year ago, a mutual friend introduced the CEOs of both two companies knowing one was mulling over new tools to rapidly construct homes and the other had the perfect tool to construct buildings in a matter of hours–the Vulcan 3-D printer. ICON’s Vulcan works quickly and efficiently with little manpower. But using such a massive 3-D printer in the developing world is tricky. For example in El Salvador, power outages are commonplace, and the terrain is sensitive to flooding and earthquakes. The Vulcan plugs into an outlet or runs on a battery, but when the electricity starts flickering, its backup, built-in generator kicks in. ICON decided to use concrete because it’s stable, but it takes time to solidify. So to expedite the process, the company developed Vulcan to use a proprietary concrete mixture that is loose enough to ooze rapidly into 1-inch thick slabs but dense enough to quickly solidify into a hardy structure. This step is important because the printing process happens in one fell swoop, allowing the Vulcan to build homes in under 24 hours. It prints homes at about 600 to 800-square feet–just enough for a three to four person family–and capable of protecting people from natural disasters. The model cost $10,000 to build.But the developers believe they can eventually be built for as low as $4,000. 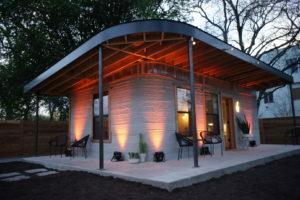 Lawrence Sass, an associate professor of architecture at the Massachusetts Institute of Technology who is not affiliated with either company, said these homes are a great start, but 3-D printing might not be the best tool for creating hazard-free homes. New Story and ICON want to focus the next year on two aspects of the house designs: durability and safety. Sass’s other main concern is the lack of support materials for windows and doors. 3-D printers lay out the structure of the home first, so someone has to go in and add the small fixings. Sass worries doors or windows won’t be secure enough in the structure to endure extreme weather events. Sass suggested that these companies look into digital fabrication, which combines the efficiency of 3-D printing with computer-aided design (CAD). It will take more time (Sass built a home in 2008 in about 20 days), but the process ensures that each nook and cranny fits securely into the structure. A trial period (possibly starting by the end of 2018) for the first homes will give the families in El Salvador a chance to customize their homes to the landscape and program their housing needs into the Vulcan.